The average mobile phone charger consumes 300 milliwatts of power even when the battery is fully charged. 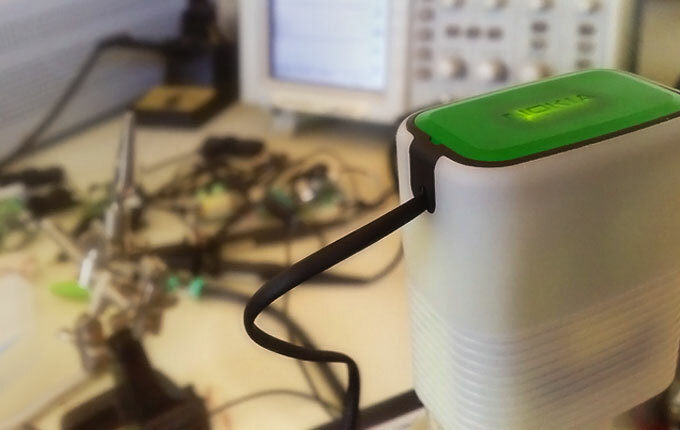 Nokia Design asked us to build a prototype charger that would consume nothing after the phone was charged. As the engineer on this project, I studied how existing Nokia chargers worked, and then I designed and built an analog circuit that could attach to the charger’s main board and, per Nokia’s request, disconnect the charger from the AC mains once charging was complete. It was a fun challenge to design it all with analog components. We ended up making ten of them, and I worked with an enclosure designer to help spec the case it went in.